Human Rights Watch released satellite photos in late 2012 that offer evidence of possible ethnic cleaning in the area near Kyaukpyu. While foreigners are usually denied access to the area, those who do go there by surreptitious means can see for themselves the damage, according to aid workers. 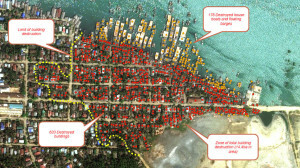 In “before” satellite images of the Kyaukpyu district called Pyitha, an overcrowded Burmese neighbourhood is shown. In an “after” image, however, no roads, buildings or other details are shown. The neighborhood has simply vanished. But what happened to it? The images seem to show that as many as 10,000 businesses and homes have been razed. Human rights workers visited the area to see if the satellite images were accurate. The devastation was described as “shocking” and “total”. Buddhists in the area said the Muslims in the neighbourhood burned down their own homes, but would they have burned down mosques as well? It didn’t make sense to those who saw the scene. But Buddhists in the area hate Muslims and are inclined to say whatever they want about them. There have been months of violence there between Buddhists and the Muslim Rohingya minority. The conflict started in June 2012, and now, some say the conflict is a deliberate effort started by Buddhists to expel minority Muslims from the area — a process that can only be called ethnic cleansing. There are as many as 100,000 Rohingya in refugee camps around the state, but what happened to those from this burned out neighbourhood isn’t completely understood. Many of them are Kaman, not Rohingya, and this conflict could be an indication that the conflict has spread to include all Muslims instead of just one sect. Many of Kyaukpyu’s former residents now apparently live in shacks and on fishing boats on an island off the coast. There is little food there and very little space. The army had been involved, according to many accounts, in driving them from their relatively comfortable homes in the city. Some were given just 30 minutes to leave by army officials, they told the human rights workers. Many went to the shoreline and got on boats, but not everyone was lucky enough to get on one. As they attempted to leave and others attempted to get on board, Buddhists are said to have surrounded some crafts, throwing stones at the occupants. As the tide rose, the boats were able to slowly escape the conflict. 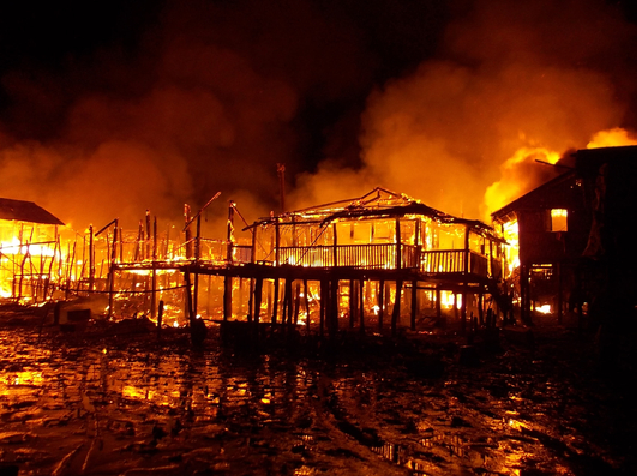 According to the police, 20 people died in Kyaukpyu, but the actual number could be much higher. An exact count isn’t available from any official source. Officially, nothing was done. Opposition leader Aung San Suu Kyi, said there was nothing she could do. No one else had made a statement indicating any pending action regarding the situation either.